I almost feel like a sucker when I pay to go see these movies. It is something you cannot help though. 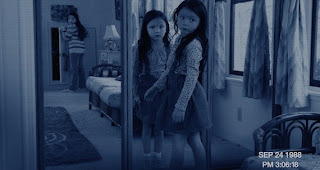 Besides the fact they are made for almost nothing and feature no-name actors, the "paranormal" movies continue to prove themselves as the only reliable source for honest scares at the movies. I was skeptical when it was announced they would be making a sequel to a film that in no way, shape or form seemed like it would be possible to create a credible follow-up. I was proved wrong when, after exiting the theater last October I was more shaken then I was the previous year after seeing the original. Again, I hoped they wouldn't run the chance of ruining the franchise by making a third one, but here we are the week of Halloween 2011 and I have just seen the third and arguably scariest installment of the series. Audiences may scream and yell at the screen and I was a little disappointed a lot of the footage from the creepy trailer didn't end up in the final film, but nonetheless the overall effect this third film has on you makes it easy to second guess every noise you hear at night as you try to get to sleep. Bringing on the guys who crafted last years oddly intriguing "Catfish" allows the "found footage" gag to still remain credible while taking the literal paranormal activity in the film to new heights. Young Katie and Kristi play a round of Bloody Mary. To break it down, if you thought the second one explained anything, wait till you see what this third film has to offer. Going back to when sisters Katie and Kristi were young in a slightly modernized 1988, this latest feature addresses what brought the demons to pick on these two young women. There is still no mention of their father as we are introduced to their mother and her new boyfriend, a wedding videographer named Dennis. Shortly after Kristi develops a friendship with a new invisible friend named Toby wierd things begin to happen. Dennis being a man who feels the need to film everything, and in some way feel as if he's doing something useful, starts to document the family's day to day as he recognizes the level of strange. Naturally, their mother ignores Dennis' claims and is forced to learn the hard way. 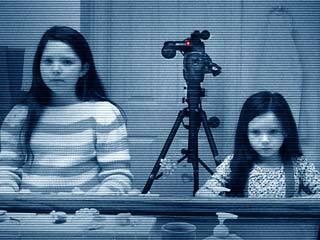 The film is paced just as well as the previous installments with that being the trick to its frightening success. The paranormal movies don't go for in your face scares with disfigured creatures or perfectly timed sound effects but instead they thrive on your anticipation. And while this one is able to take the things that go bump in the night to a new level the scares are still subtle with the effect being even greater. In relation to the methods these movies use to scare there audience it is almost an experiment in what people really want from their scary movies. Not in a long time have I felt tense when watching a glossy hollywood production that enlists some major villian to chase down and kill his victims. As odd as it may sound, movies using the "found footage" technique are almost the only way to go if you want to craft a legitametely frightening film. It adds a sense of reality. It does not take you out of the situation, but instead gives you the feeling you could just as easily be staring into nothing yet be positive you heard something move. The makers know this and they know that story is just as important as well. The combination is what continues to make these films a hit. We are intrigued by the plight of these two young women. We have seen what they have come to be and in being given a glimpse as to how they got there we ponder just as many new questions as answers we recieve. Why the simultaneous events of the first two films occured is given purpose when we hear little Kristi utter those words, "Okay, I'll do it!" to Toby but once we experience an unexpected turn in the finale it is hard to imagine how these girls turned out so normal. As I did last year I hope they don't stretch this series out to the point it becomes a joke or too hokey and people no longer flock to see them. I am really rooting for the franchise to remain credible but can accept the fact they will likely be able to squeeze one more film out of this. Those inbetween years would easily be better if we knew nothing of how they were raised but there is a yearning to know how the girls turned out so unjaded as adults in the first two movies. It would be even harder to explain having this much "found footage" on these two young girls lives but I am sure there will be some creative twist on that though I can only buy the fact every man in their lives has an obsession with cameras. 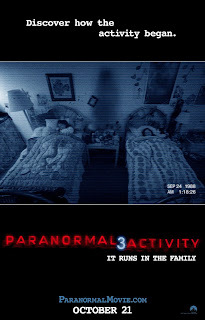 I would be pleased if this was the last "Paranormal Activity" but have no doubt I will be in a theater a year from now watching either the teenage years or the aftermath of what happened in films one and two. In ways I can't complain because I stand by the fact these are the only "real" scary movies on the market and to have no more would be to go without any hope for the horror genre. On the other side of things, if this turns into the "Saw" franchise, I'm gonna be pissed. I trust you Oren Peli, you haven't let us down so far. Don't start now.